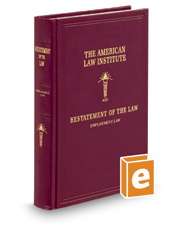 This project of the reputable American Law Institute – Restatement of the Law, Employment Law – restates and clarifies the common law of employment. Although federal and state statutes regulate the employment relationship, major aspects continue to be governed by law developed by state appellate courts, and doctrine has changed significantly in recent decades. Subjects covered in this restatement unit include the employment relationship, termination of employment contracts, compensation and benefits, employer liability for harm to employees, wrongful discharge, employee privacy and autonomy, employee obligations, restrictive covenants, and remedies. Restatements are enormously influential with courts, legislatures, and in legal scholarship and education. This authoritative text provides coherence and guidance to practitioners and courts with clear and concise statements of the law, discussion of leading cases from many jurisdictions, illustrations, and discussion of trends in developing law.